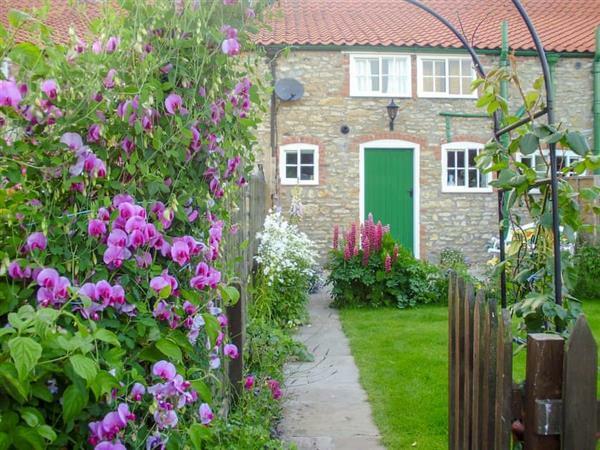 Marmaduke Cottage in Sancton, near Market Weighton, Yorkshire sleeps 3 people. Marmaduke Cottage near Market Weighton is a small period property located in the small village of Sancton, midway between York and Beverley in the heart of the East Riding of Yorkshire, and offers comfortable accommodation. On entering this terraced cottage is the living room which still has the original range open fire and beamed ceiling. With plenty of comfy seating and the fire, this room is certainly the place where you will want to relax after a long day exploring the local area. Leading from the sitting room to the rear of the property is the well-proportioned farmhouse-style kitchen and dining area. The pine kitchen and Belfast sink, along with the terracotta flooring really help to make this room the heart of the home. The chef in the family will enjoy providing great home cooked food in this country kitchen. From the kitchen is access to a delightful small garden which has both a patio and lawned area. A small garden shed is provided which offers bike storage. The garden benefits from the afternoon sun and is ideally situated for al fresco dining in the evening. The upstairs of the cottage has both a double and a single bedroom, making this ideal for couples or a small family. Both bedrooms retain period features including the original fireplace, sloped ceilings and a low window in the single room. Both are decorated to a very good standard with furniture in keeping with a historical cottage. The beds offer a great level of comfort which will guarantee a great night’s sleep leaving you refreshed and ready for another day. If you enjoy walking, birdwatching, cycling or exploring the many stately homes and grand houses this area has to offer, Marmaduke Cottage is the place to be. There is easy access to some of the best RSPB reserves on the east coast, as well as great beaches and the beautiful market towns of Market Weighton and Malton on its doorstep. For those wishing to indulge in shopping, there is just too much choice with both York and Beverly offering many independent boutiques, cafés and restaurants in stunning historical surroundings. The Yorkshire Wolds offer rolling countryside with miles of public footpaths and bridle ways to explore; there are also some great cycle routes along which you will find quaint coffee shops and traditional Yorkshire pubs offering wonderful Yorkshire fayre. Marmaduke Cottage will leave you with lasting memories and wishing that you could return. The beach is 20 miles from Marmaduke Cottage near Market Weighton. With the shop 2 miles, and the pub & restaurant are 200 yards from Marmaduke Cottage. Living room: With open fire, 22 Freeview TV, DVD player and beams. Kitchen/dining room: Farmhouse style with electric oven, electric hob, microwave, fridge/freezer, washing machine, beams and tiled floor. Bedroom 2: With single bed and low window. Gas central heating, electricity, bed linen, towels and Wi-Fi included. Initial fuel for open fire included. Travel cot available on request. Welcome pack. Small enclosed lawned garden with patio and garden furniture. Bike store. Private parking for 1 car; additional on road parking. No smoking. For a better idea of where Marmaduke Cottage is, you can see Marmaduke Cottage on the map below. Marmaduke Cottage is in North Yorkshire; should you be on the lookout for a special offer, you can find all the special offers in North Yorkshire. It's always worth checking to see what is on offer at the moment. Do you want to holiday near Marmaduke Cottage (UK10711), you can see other cottages within 25 miles of Marmaduke Cottage; have a look to find your perfect holiday location.